Indy is back for a fourth (and likely final for Ford) outing, set during the 1950s Cold War era. 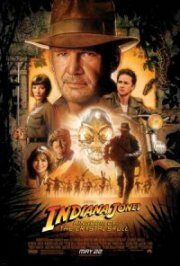 Indy encounters a young renegade who needs his help in finding the mysterious Crystal Skull of Akator. According to legend , the skull was stolen from a mysterious City of Gold guarded by the living dead in the Amazon. Whoever returns it to the city's temple will become master of the Skull's powers. Together they travel to Peru where they find themselves battling the Soviets who want the power of the skull as an advantage in the Cold War. Comments Quite a lot of threat, menace and suspense.